Direct transfer through the hands of clinical practitioners or contaminated equipment. Invasive devices e.g. Intravenous cannulation. 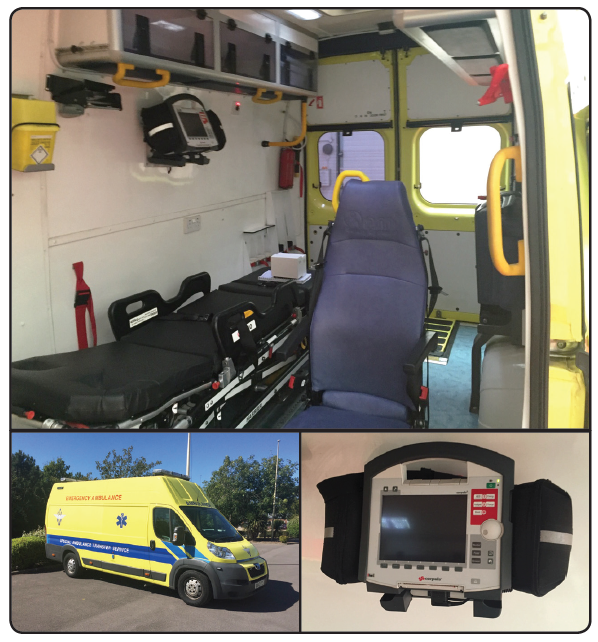 The emergency environment and medical devices / equipment are the two areas where cleaning and disinfection with the correct products and protocols can have a significant impact on reducing the infection risk within ambulances. The confined space within the ambulance (see Figure 1). The quantity of equipment contained within the ambulance (i.e. trolleys, mattresses, seats, monitoring equipment, oxygen lines, lockers etc.) (see Figure 1). Delicate medical devices which are often easily damaged by corrosive chemicals such as alcohol or chlorine based disinfectants. 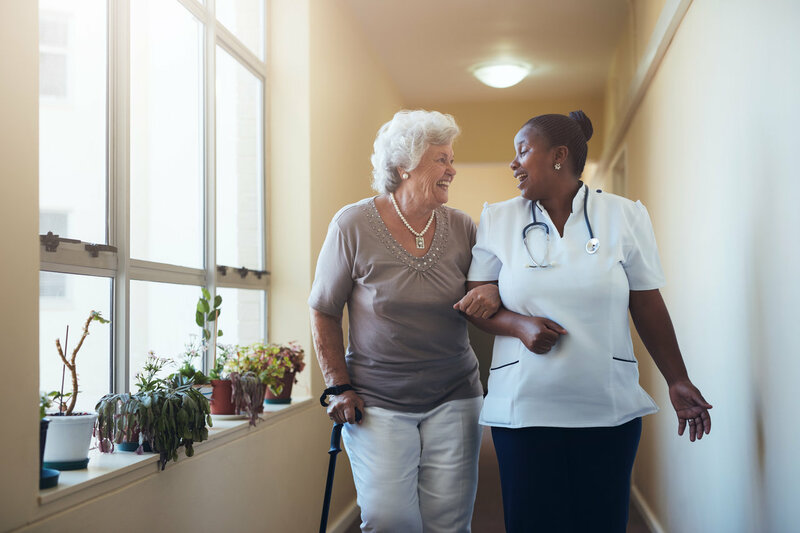 Occupancy rates and minimal down time – ambulances are often used in shifts and there is typically limited if any spare time with which to perform routine cleaning and disinfection. The key challenge for ambulance services is to ensure that any disinfection process for their vehicles is simple to perform, rapid (to fit in with the limited availability of staff/ambulance ‘down-time’) and non-corrosive / damaging for all surfaces or medical equipment contained within the ambulance. The aim of this work was to develop a rapid and totally new approach and protocol to enhance ambulance disinfection in order to ensure any microbial risk posed by the interior of the ambulance was minimised to its lowest possible level. In order to validate any new disinfection protocol the number of bacteria (bioburden) present at multiple locations within a working ambulance pre and post disinfection must be quantified. To affect a rapid kill of microbes within the ambulance a new, clinically proven, single use, broad spectrum disinfectant aerosol product was used. 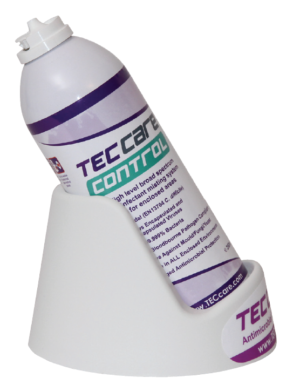 This disinfectant is powered by TECcare® CONTROL Technology (see Figure 2). To determine the impact of the aerosol on the bacteria present within the ambulance, specialist contact slides were used to quantify the number of microbes (bioburden) present on multiple surfaces and pieces of equipment both before and after use of the aerosol disinfectant. The contact slides enabled the total number of microbes (total viable count = TVC) to be reported at each test location. In addition, the slides also allowed the identification of six different microbial species as follows; E. Coli; Micrococcus; Bacillus; Proteus; Yeast; Staph Aureus. Prior to activating the aerosol all windows were closed in the rear of the ambulance and all electrical equipment and oxygen supplies were turned off or isolated. NOTE: The ambulance used for the testing was not pre-cleaned or swept out in any way and there was the daily accumulation of detritus, dirt and dust present on the floor. ‘Pre-disinfection’ contact slides were taken from seven predetermined locations (see Table 1). A single 250ml aerosol was placed in its cradle (see Figure 2) on the floor at the rear of the ambulance. The aerosol was activated by depressing the nozzle until it clicked into the ‘on’ position. As soon as the aerosol was activated the doors of the ambulance were closed. After 10 minutes the aerosol had dispensed the TECcare CONTROL disinfectant which had dispersed throughout the interior of the ambulance. A further 20 minutes was allowed for the disinfectant mist to settle onto the interior surfaces. Thirty minutes after activating the aerosol the ambulance doors were opened in-order to vent the area. Venting should last for approximately 2 minutes. ‘Post-disinfection’ contact slides were taken from the test locations detailed in Table 1 one hour after the aerosol was activated. Contact slides were incubated at 37oC for 48 hours and slides were read to determine bioburden present pre and post aerosol disinfection. Table 1. Contact slide test results for total viable count of bacteria present pre and post disinfection of the ambulance with the aerosol. Bacteria were eliminated from six of the seven test surfaces after using the aerosol. In the single location (rear section of the floor) where bacteria were not totally eliminated, there was a 4 Log reduction from 105 to 101 (equivalent to a 99.99% reduction) in the number of bacteria reported at this location after the aerosol disinfection had been performed. The contact slides taken before using the aerosol reported multiple bacterial strains being present at these locations including; E. coli, Proteus and Staph. Aureus. The results in Table 1 clearly show that bacteria were present inside the ambulance on all surfaces tested with the contact slides. In some locations there was a significant bioburden with approx. 100,000 bacteria present on some surfaces. The bacterial species identified (E. coli, Proteus and Staph. Aureus), are associated with healthcare associated infections such as: gastro-intestinal or blood (sepsis) infections; urinary tract infections; and skin, wound, blood (sepsis) infections respectively. Using the disinfectant aerosol misting system effectively eliminated all bacteria from six of the seven test locations and in the single location where bacteria were not totally eradicated the aerosol system reduced the number of bacteria on the surface by 99.99% (for example from 10,000 bacteria down to 1). 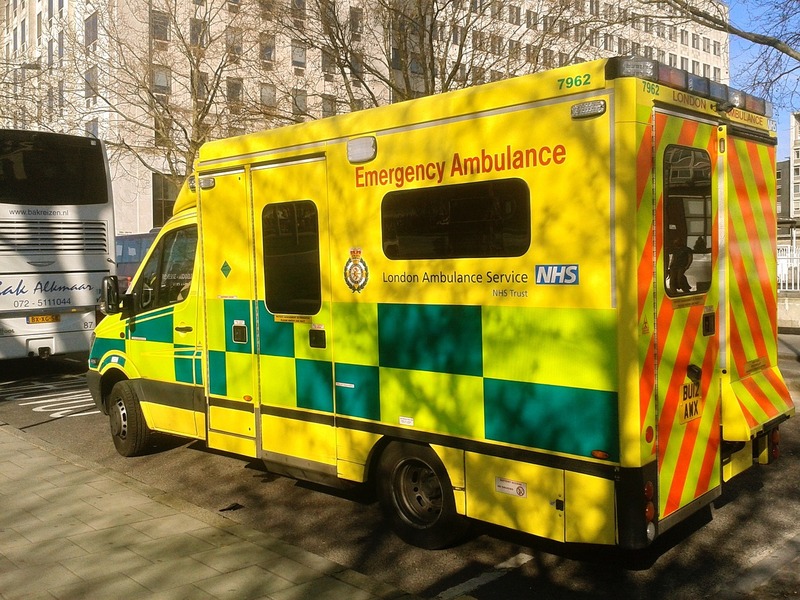 The type of patients transported in ambulances are often going to be at an elevated risk of infection i.e. 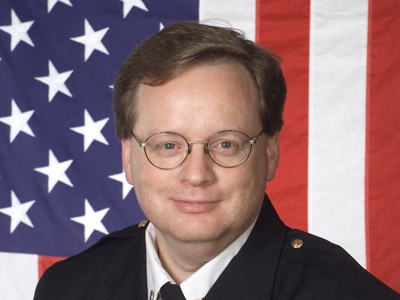 those with severe traumatic injuries and open wounds and/or those who are particularly unwell. Therefore, there is an obvious need for the ambulance environment to be as clean as possible in-order to minimise any risk of cross contamination or cross infection posed to the patients and staff exposed to the inside of the ambulance. The need to create clean and safe ambulance environments for patient care is universally agreed and while effective cleaning and disinfection protocols for ambulances are already available the key issue is how to fit these processes into already stretched ambulance services where there is a rapid turn-around between patients and where clinical staff are often too busy to perform the level of cleaning and disinfection that is required in order to maintain a safe working environment on an ongoing basis. 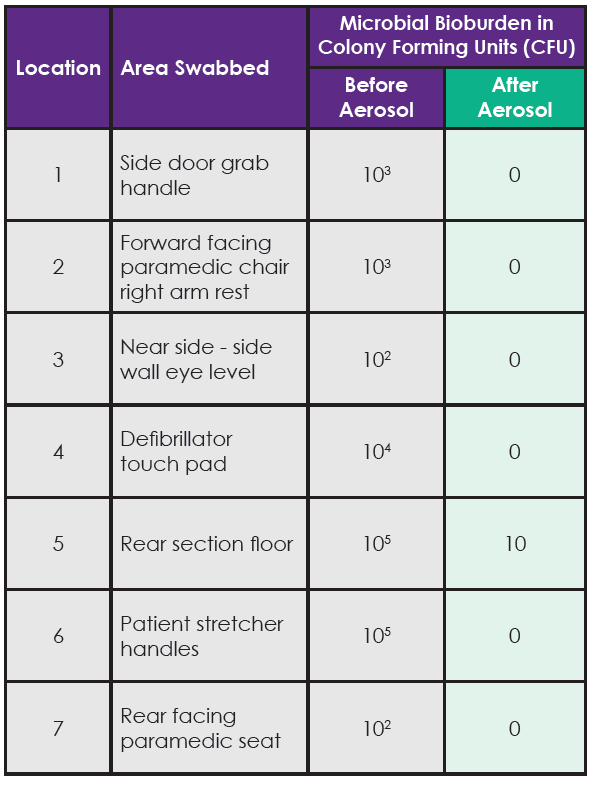 Whilst the new aerosol disinfectant does not negate the need to perform regular manual cleaning it offers ambulance services the opportunity to safeguard both staff and patients by implementing a simple and very rapid method with which to disinfect the ambulance within 30 minutes without requiring significant input from the ambulance crew. This approach minimises the risk of cross infection and infection posed by ambulances. A key additional benefit to the disinfectant aerosol is that it is non-corrosive and very gentle on all interior ambulance surfaces and medical devices. With cleaner clinical environments reducing the risk of infection a cleaner ambulance environment and cleaner equipment within the ambulance will reduce the infection risk to both patients and staff. Since this new process does not require any additional labour it could easily be performed between patients, during breaks on shift, at shift change or and the start/end of the working day. Welsh ambulance services NHS Trust Infection Prevention and Control Guidance and Procedures. 2013. Policy document available on-line [58 pages]; accessed 16th March 2017. Available from: http://www. ambulance.wales.nhs.uk/assets/documents/d1218d90-08e6-4171-93d4- a51dd413c061635654224633584392.pdf. Orenstein R, Aronhalt KC, McManus JE Jr, Fedraw LA. A targeted strategy to wipe out Clostridium difficile. Infect Control Hosp Epidemiol 2011 Nov;32(11):1137-9. Hayden MK, Bonten MJ, Blom DW, Lyle EA, van de Vijver DA, Weinstein RA. Reduction in acquisition of vancomycin-resistant enterococcus after enforcement of routine environmental cleaning measures. Clin Infect Dis 2006 Jun 1;42(11):1552-60.